I finally decided it was a good idea to get organised and to get our hospital bags packed! You'd think with E arriving early I'd have done it already but you know what they say, better late than never. 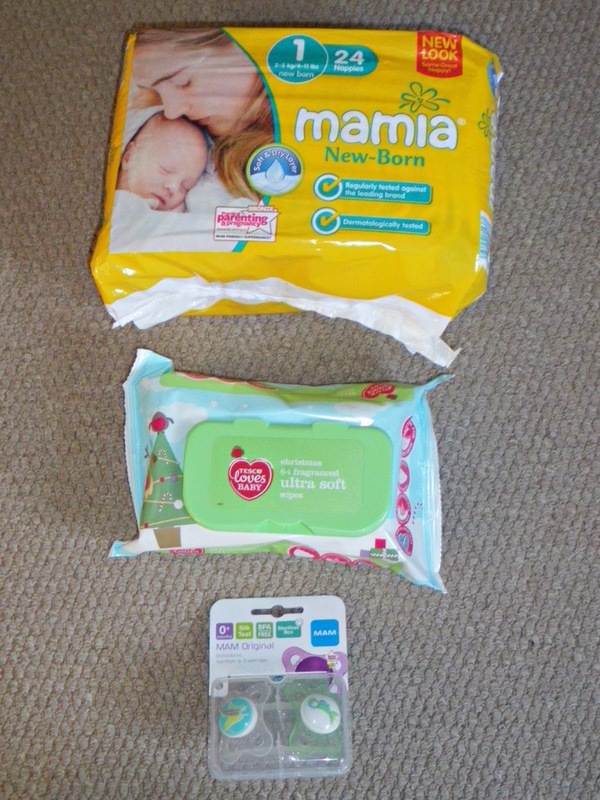 Mamia (Aldi) newborn nappies and Tesco wet wipes - I don't have a preference for wet wipes but I do like the easy to reseal packets. I've been using Aldi's nappies since E was a few weeks old because they are such a good fit, absorbent and a brilliant price (this packet is just £1.69). I've also popped some MAM dummies in, just in case! 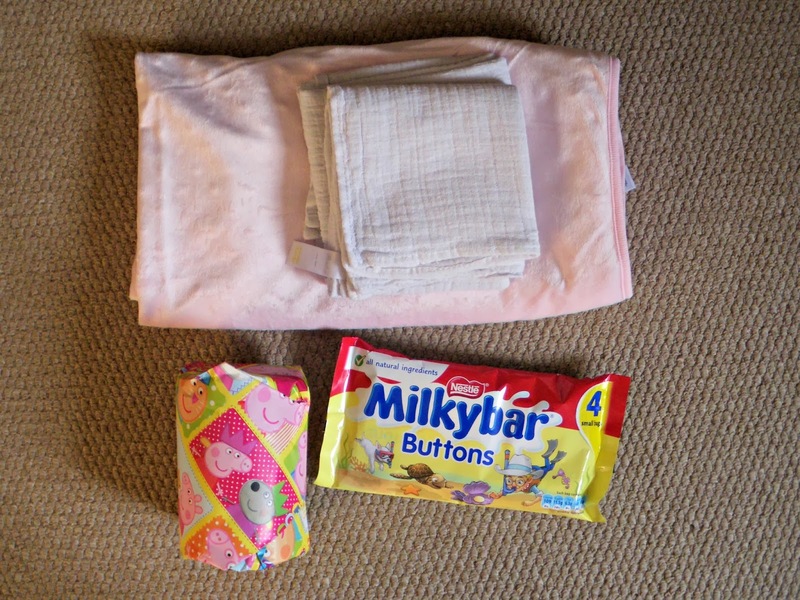 A super soft pink blanket from Sainsburys (and a bargain at only £7) and those trusty muslin cloths. The chocolate and present are for E when she visits. The present is a Peppa Pig toy in a personalised tin, which I can't share as it has the baby's name on it! I've brought her a little musical microphone as well to pop in the bag. 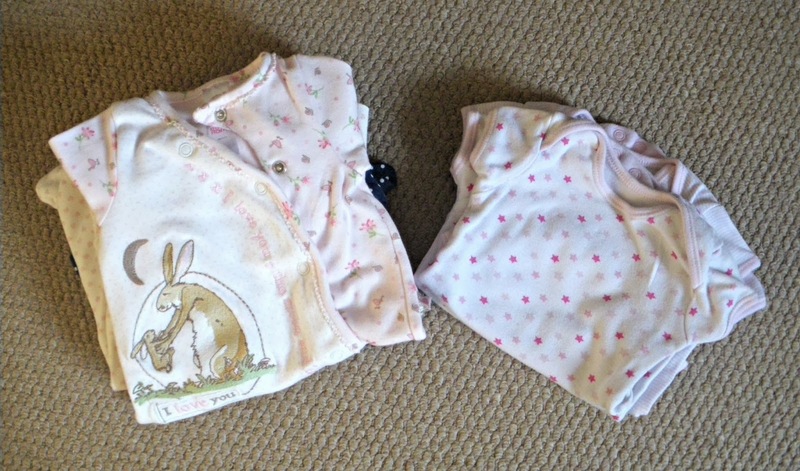 4 vests and 4 babygrows (I must double check but I think these have built in scratch mitts). Whilst I'm obviously re-using a lot of E's things, there are some things that I'm buying new. These babygrows, for example, are new (I wanted new to bring her home in!) but the vests were E's. I am planning to breastfeed (provided there are no complications) so I haven't packed any bottles. I think this is everything - have I forgotten anything? I can't find the list I had from packing for E and my mind seems to have gone blank - we didn't use booties (they kept falling off) or hats - she was born in August so we were worried about making her too warm. 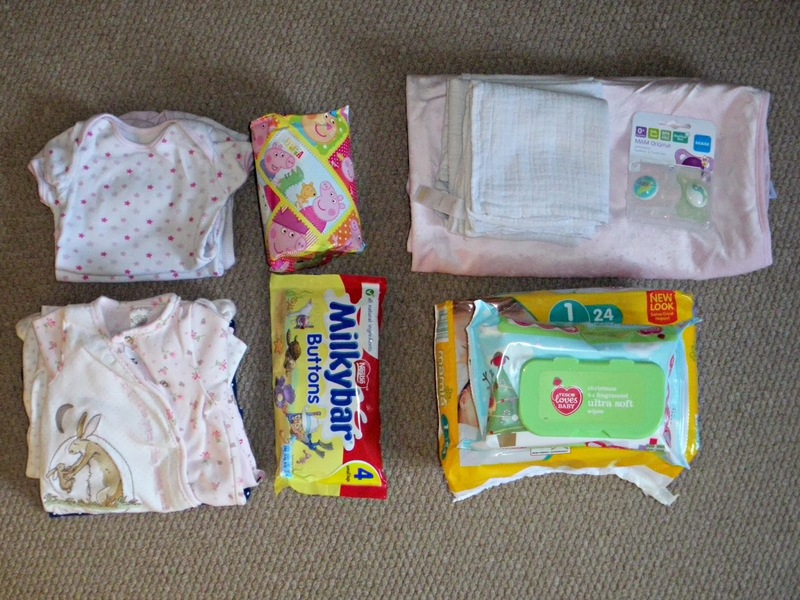 If there's anything you can think of let me know (cotton wool, nappy sacks etc aren't pictured! ).